Oasis fans who pre-order a copy of the band's new album Dig Out Your Soul from iTunes are to receive a free bonus track. I Believe In All was written by the band's frontman Liam Gallagher and is not included on the full album. If you pre-order the album, you will receive the track as a free download. In addition, those who pre-order will also receive the album track Falling Down at the time of ordering. All in all, it sounds like a pretty fair deal. Oasis have also announced that they will make a "simple" ten-track version of the album available to download for £5 when the album is released. Being that the original album contains 11 songs, that's only one less. Wonder which one they're bagging? Bag It Up, perhaps? 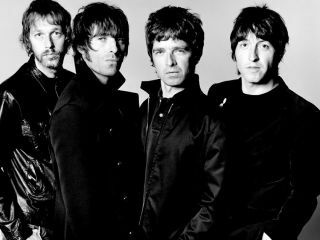 In other news, Oasis has postponed three additional shows in the wake of injuries suffered by guitarist Noel Gallagher during a Sept. 7 bum-rush attack onstage in Toronto. According to the band's website, Gallagher has three broken and dislodged ribs and has been advised by his doctor not to perform for another week. Concerts this Saturday (Sept. 27) in Cornwall, England, Sept. 29 in Koln, Germany, and Sept. 30 in Paris have been postponed and will be rescheduled. Fans are advised to retain their tickets pending further announcements. The week of the attack, Oasis scratched shows in London, Ontario, and New York City. However, the Oct. 7 launch of a UK arena tour won't be affected by Gallagher's injuries, according to the site. It would take more than some broken bones for him to miss that.